This big Grey baby elephant, with a curved trunk and big floppy ears, is ready for big cuddles and games. Knitted in recycled T-shirt yarn your big baby elephant will grow very quickly! Garter stitch is very stretchy and it is this property which makes this Elephant pattern work! All the curves of the elephant will emerge as you sew and stuff your toy Baby elephant is knitted in a single garter stitch piece starting at the back legs and finishing at the tip of the trunk. Your toy is assembled with very few seams and some interesting but not complicated folding. My pattern is illustrated to show you exactly how to sew up your elephant. You will need to know how to cast on. Bind off, kfb and slip stitches and turn work part way through a row. Basic short rows are used to shape the head and trunk. I explain how to work the short rows in each line. Every line is given in full, so confident beginners can enjoy this pattern. 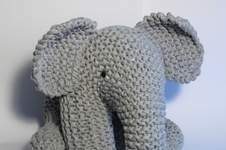 Size-approx.35cm /14” tall x 46cm /18” from trunk to tail As T-shirt yarn varies in thickness (differences are due to the fabrics used) your Elephant may finish slightly smaller.